Outdoor adventure activities in and around the Lake District. 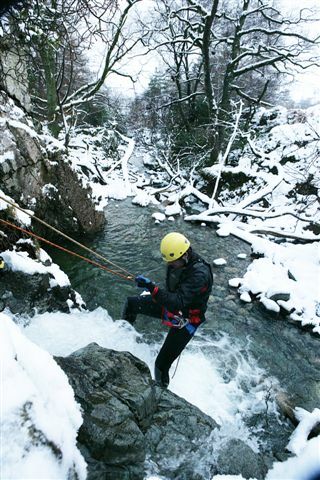 If you are looking for rocky adventure we'll take you to the best caves, crags and gorges, to sample abseiling, climbing, aquaseiling, canyonning, gorge waking, ghyll scrambling, caving or potholing around the Lakes and Dales. If it's off-road motor sports you want we have: Quad Bikes, Go-Karts, Rally Bugs, Mad Trax, Argocats, Stalwarts and 4 x 4's. Offering plenty of wheely fun! Why not make a day of it by adding archery, air rifle or clay pigeon shooting? What about watersports? - for the hardy these go on all year, with active gorge based activities, and raft building. As the weather warms up we get more enthusiastic about canoeing, kayaking, water skiing and sailing! And what else? Horse Riding, Treks, Orienteering, Mountain Bike Hire, Bushcraft and much, much more. Active Adventures are ideal for adult groups (for mixed ages check friends & family). Some activities are fine for most group sizes some work best for a small group, others with larger one... Paintballing with 4 would be dull but 30 Quads on one track would be a mayhem, We have the flexibility to cater for large groups by also combining activities (see also corporate) and individuals can take part alone (see also friends & family) on many activities. Check the list of adventurous activities below...click for more details. See what you like then contact us to check availability and prices for your group. You'll need to tell us when you plan to come, what sort of group you are and how many you think you could be.